Just along the High Street from The George, Ethel Loves Me is part art gallery, part unique lifestyle and gift shop, showcasing and selling original pieces from local makers, artists, artisans, craftspeople and creatives. Ethel is putting on two workshops in April. ‘Marbling for Kids’ takes place on Tuesday, April 16th and is suitable for children aged 4 and upwards. 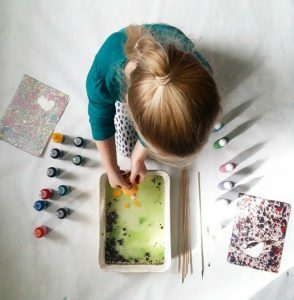 Children will learn the magical art of marbling. They will work independently on this simple technique for creating marbled patterns on paper guided by experienced art teacher (DBS checked), Cadell Cruse. Marbling is fast, fun and has spectacular results that children will be proud to take home with them. The cost is £10 per child for a 45 minute session. The following Wednesday (24th April) adults can have some fun with Lino Printing. Design, carve and print your own Lino template. Learn how to use the Lino printing process that can be used to create images on paper and fabric. Once you have created your template you will be able to use it again for projects at home. £28 per person for a 3 hour workshop which starts at 10:30am. Please see Ethel’s website for further details and booking tickets.